Avira Phantom VPN is free anonymization software that allows its users to surf the web securely and anonymously. The free Avira Phantom VPN service is ideal for keeping your activities private and hidden from your ISP. Avira Phantom VPN is free anonymization software that allows its users to surf the web securely and anonymously. Version 2.23.1.32633 is a freeware program which does not have restrictions and it's free so it doesn't cost anything. 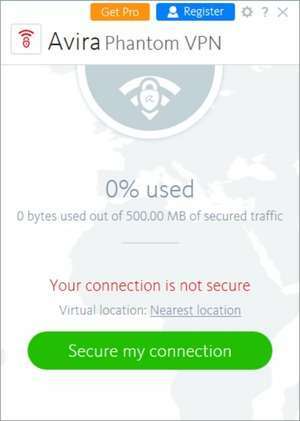 For security reasons, you should also check out the Avira Phantom VPN download at LO4D.com which includes virus and malware tests. Additional screenshots of this application download may be available, too. Protect yourself on the web with our selective list of free proxy services offered by various organizations. You may free download anonymizer software in this category along with reviews. Check out some of the freeware downloads available in the anonymizer category. They contain no strings and are available at zero cost.